At what point does hope become harmful? When does faith become false presumption? How much planning is vanity? If I were pregnant I would be planning a baby shower. If I were pregnant I would be decorating a nursery. I would be working on my birth plan. That is what our society says "being prepared" is. We anticipate the arrival of a child (or children). As I've said before, the logical outcome of the adoption process (assuming you've done the paperwork, paid the fees, and stick with the waiting) is that, at some point, there will be a child who needs a home. But the point at which that happens is completely unknown. This is the logical, even tempered (albeit frustrating), human-view. What is the most mind blowing, life changing, pure joy inducing, make-you-wanna-jump-outa-your-skin-with-anticipation-view? The God-view. This view has nothing to do with paperwork or fees. Nothing to do with earthly logic. I can't wait to see what God has seen all along! Hope becomes harmful when it's based on something other than God. We do not hope in our agency, in our social worker, in our blog or Facebook page. We hope in The Hope. Faith becomes presumption when you treat God like a vending machine. Yes, we pray that God will give us a child, but there is no slot to deposit our prayer and then receive our ordered outcome. We pray and if God says no, we must accept that He sees what we can't. We have faith in God's unseen plan. Planning becomes vanity when you stop trusting God to provide. Worrying that we won't have what we "need" when the time comes, we won't have the finances, we won't have time to accomplish what we think we should. It's all vanity. If God is orchestrating this mind blowing outcome, what makes us think He is not also taking care of the details before and after. This one is probably the hardest one for me to hold on to. I'm a planner. I think most people are. Part of me wants to go out and buy every baby item I can (more of a desire than a need). We don't need gobs of baby gear. Part of me is worried our savings will give out. 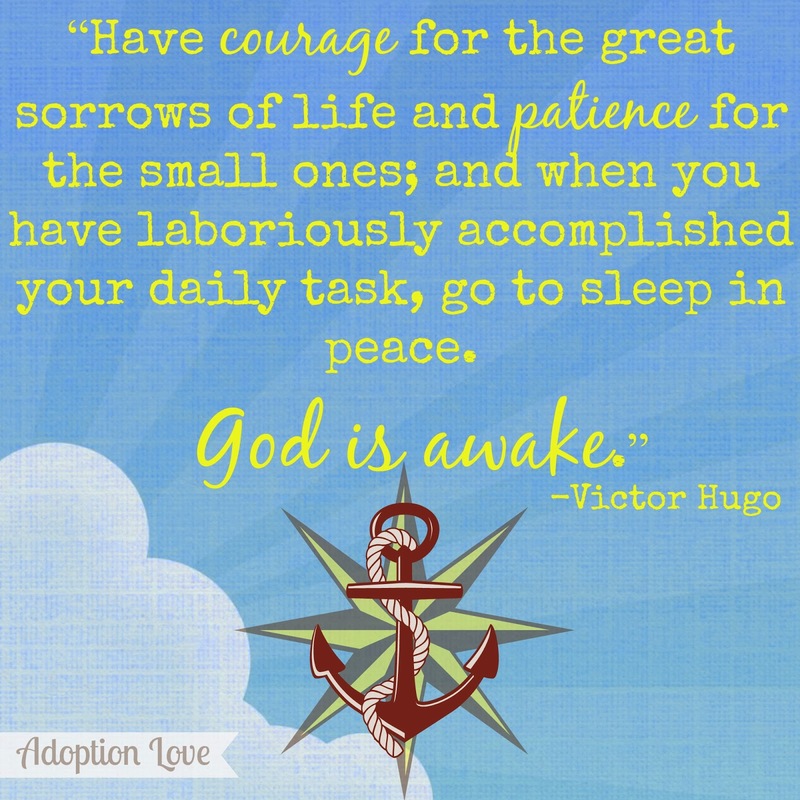 If adoption is what God wants for us He will provide the finances. Part of me would like to research other agencies. Not for any specific reason other than my own impatience. Our agency is moving as fast as God will allow. We have prayed about choosing a different path and always get a resounding NO. We have no doubt our expectant mom and child(ren) will come to us through Adoption Center of Hope. We have prayed about all these things and in our hearts, in our minds, and from scripture, we know God will provide. So we walk the tight rope between the meager knowledge of our human-view and what we know about the God-view. We know that God is in control, that He loves us, that He has a perfect mind blowing plan for our family. So while we plan, we ask God to guide our planning. Every step we take, we take with Him. Love it! I have experienced this in my own life. My husband and I married with plenty of plans. And most of them have fallen through. So, we've kind of adopted a different strategy. We don't hold too much to our plans anymore. I'm not saying we don't make them because that wouldn't be good either to just float aimlessly through life. We just hold onto them loosely understanding that they may not work out. I did a Bible study a few years ago through the book of Jonah called Jonah: Navigating a Life Interrupted by Priscilla Shirer. I highly recommend this Bible study! I learned so much! I think you have a great perspective and I know it can be easy to say one thing but think another. I hope you'll read over your own words as encouragement when you feel down and hold tight to the truth you know. Ready for that ball to drop!